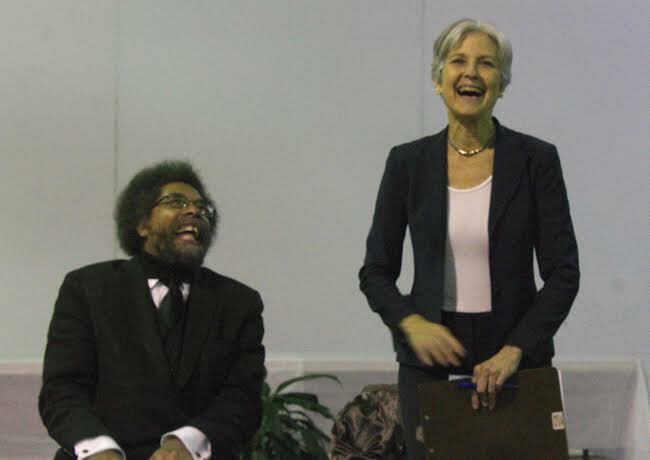 (APN) ATLANTA — Jill Stein, who is seeking the Green Party’s nomination for President and who was the party’s nominee in 2012; and renowned academic Cornel West are pushing for third-party ballot access in Georgia. The pair visited Atlanta on November 20, 2015 to stump for Stein’s campaign and work on collecting the required 50,000 signatures to get her name on the 2016 ballot. As previously reported by Atlanta Progressive News, Georgia is among the worst when it comes to ballot access for independent and minor party (“political body”) candidates. While Democrats and Republicans running statewide only need their parties’ nominations, other statewide candidates must submit a petition with signatures equal to at least one percent of the number of people registered to vote for the same office in the most recent election. For the upcoming Presidential election, that’s about 50,000 signatures that Stein needs, even if she does receive the nomination. The rules seem especially problematic, given the growing number of voters who identify as independent. Earlier this year, a Gallup poll found that a new record––43 percent––of Americans don’t identify with a party. “You can’t vote against gentrification because there’s no party [on the ballot] that stands against gentrification. You can’t vote for peace because there’s no party [on the ballot] that stands for peace,” he said. Stein contends her message of, “People, planet, and peace over profit,” resonates with voters, when she’s able to reach them. But too often she is obstructed. Stein also ran for president in 2012 and was arrested, along with her running mate, for trying to enter the Presidential debates at Hofstra University on Long Island, New York. They were shackled to chairs for eight hours before being released. “[The Presidential debates] are extravagant propaganda events… and they are intended to make us think that we are sidelined and that we have nothing to do with our political process and therefore should surrender. And of course they are absolutely wrong about that,” Stein said in her speech. “We don’t have to change people’s minds. People already agree with us on the issues. All we have to do is organize… There are so many solutions here. We can transform our way forward if we harness the public will that’s already there,” she said. Stein’s solutions to the problems plaguing the United States include canceling all student debt; implementing a Green New Deal that would create 20 million jobs that would “get us out of the climate crisis”; decriminalizing nonviolent drug offenses; and creating a system of participatory budgeting so that citizens are directly involved in determining how their tax dollars are spent. Stein’s politics align in many ways with U.S. Sen. Bernie Sanders (I-VT), the Democratic Socialist seeking the Democratic nomination for President. Sanders also visited Atlanta again recently, packing the Fox Theatre with young, enthusiastic supporters and receiving a powerful endorsement from Atlanta rapper Killer Mike. “I wish Bernie all the luck in the world, I’m pulling for him, but I just don’t have faith in that Democratic Party. It has a thing called the kill switch. The Democratic Party has used the kill switch on every progressive campaign since George McGovern managed to get the nomination in 1972,” Stein said. But, “If he does win, he’s still got to deal with the capitalist structural constraints. He’s still got to deal with corporate America. He’s still got to deal with Wall Street. He’s still got to deal with the empire. And that’s a whole lot to deal with, if you don’t have a strong social movement keeping pressure on you for accountability,” West said. “When I think of sister Jill Stein, I think of somebody who is a long distance runner for justice. And I’ve always viewed her and the Green Party and so many other Leftists and Progressives as part of the same movement,” he said. Brother West! What up? Yes yes and yes to your criticisms of the democratic establishment. But you can’t give firebrand speeches for Brother Bernie & Sister Jill. What happens if, as Killer Mike believes, Bernie turns the tide in the African American “community” and we overcome Hill’s Southern firewall? Does Sister Jill play spoiler like Nader to a man of conscience? For God’s sake, he’s leading the Pope for Time’s Person of the Year!!! We need you and Sister Jill to help Brother Bernie win the primary, the gens & then the revolution can be televised! Very upset that this site took down my last comment. Atlantaprogressiveness clearly does not stand for a principle of progressivity:free speech. One question: how can Cornell West undermine Bernie’s candidacy after such rousing endorsements with the threat of a Clinton presidency? As much as Jill Stein ‘s platform resonates, Professor West ought to consider The Nader effect in bush v gore as it pertains to someone he seemingly so empassionately endorsed only a week back. For shame to this publication for blocking my most recent comment. Your comment was pending in moderation. Both your comments have now been approved. Regarding this idea that the Green Party undermines the Democratic Party — if anything it is the Democratic Party that undermines the Green Party.